Getting caught in the dark is one of the most pervasive dangers facing tactical and law enforcement professionals. Prevent the risk by keeping a flashlight close and accessible with the N50 Nylon Duty Stinger Flashlight Holder from DeSantis. Designed to a hold a classic Stinger-style flashlight, the case features a vertical sleeve design that offers a snug and reliable fit. Constructed from durable military-grade nylon with a Velcro® closure, the holder both protects the light and offers secure item retention. The seams are double-stitched for added strength, guaranteeing the N50 will not fall apart under the stress of daily use. 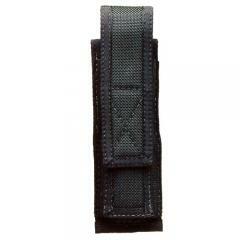 The rear belt loop accommodates belts up to 2.25-inches for maximum versatility. Magnum 10% Pepper Foam Spray 4.1 oz. Large 10% Pepper Foam Spray 2.36 oz.